Making a Difference for Pets in Pasco County! 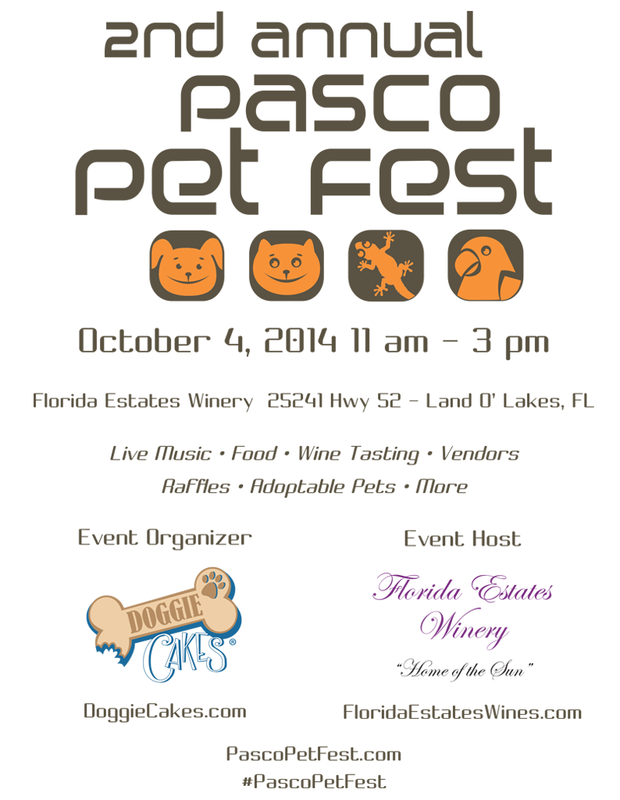 Doggie Cakes is hosting Pasco Pet Fest, on October 4th, 2014 – an annual event, with expected attendance of 1,000 to 2,000 people. The festival promotes adoptable pets in Pasco County, FL and surrounding areas. All of the proceeds will be donated to a local 501c animal rescue, Raffle Rescue, inc. Many other rescues will attend at no cost, and will have opportunity to solicit donations and to promote their adoptions and programs. The festival is being held at Florida Estates Winery, with vendors, food trucks, raffles, giveaways, adoptable pets, live music, and of course wine tasting. The event is FREE and open to the public. Your contribution as an advertiser helps underwrite this exciting and unmatched community festival.